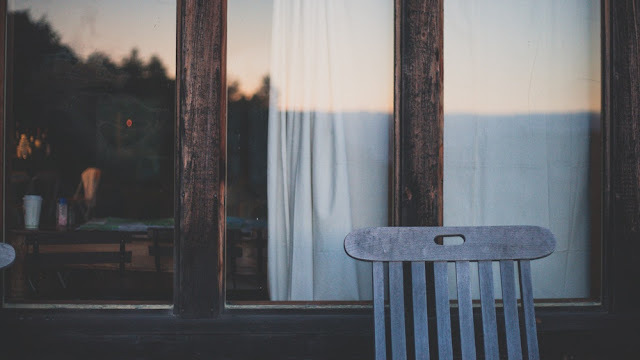 Flash Fiction: "The Other Side of the Window" by Fadila Henry | LADY. Marion wanted nothing more than to feel glad at seeing him standing down there, trapped between sky and sidewalk, staring up at her with obvious despair before disappearing into the velvet night. But she was filled instead with a ridiculous sadness. André had taken their baby into the next room to put to sleep, so she continued her futile vigil at the window. She was stupefied by forgotten feelings of some vestigial of love that she didn’t realize lingered inside her still, and that she no longer wanted to possess. Marion had spent countless long days during their affair pretending not to notice all the things about them that prophesied their downfall from the start. All the glaring markers of red that freckled the road they stumbled upon together in the pursuit of happiness, through a mismatched love they were so comfortable in. He stayed because he had found someone to control. In his reticent and cunning way, he wound a spectral web of deceit around the very love she cherished in order to pursue his best interests. And Marion - who was fully aware of who he was at his core and the manifold secrets wrapped inside him - allowed herself to be fooled, knowingly. Every day, knowingly. But as doomed as it was destined to be, she had loved him more than she would ever dare admit to a soul. Staring out the window into the inky, thundering night, she remembered with vague anguish the sadness, the overwhelming misery of her heartbreak, and her speedy departure to Zurich to recover far away from his insightful eyes, gli occhi verdi, she used to adore. “Max is asleep. And you, aren’t you tired?” André’s voice tore through the spell of her nocturnal daydream. It pained her to think of the months it took to forget the things she loved most about him, to stop herself from seeking them out in another, and the unwitting hearts she’d stepped on as she fled from those who weren’t just like him in this way or that. How unfair she had been in her quest to find love again, but Marion couldn’t help it. Lucia had begun to grow impatient with her. Even blood relations could tolerate only so much gloom lurking in their home. There were days she spent piecing together vestiges of her broken heart, only to tear it apart at the seams at night with warm tears as chronic memories filled her mind. Unbridled anger began building up inside her toward the one guilty of her pain, anger for ruining her far-fetched dreams and pushing her off the path she had been so ready to settle on. It had taken a long time to rid herself of all the lousy feelings that came with her forlorn depression. Marion lost herself so far down the shaft of darkness she didn’t know how to return, giving into the ultimate companion of the miserable and broken hearted – the encompassing black solitude. She found some absurd sweetness in spending days at a time dwelling in the depths of painful recollections of once treasured words, words that now echoed empty. In sleeping in moroseness and waking in despair. It all became so addictive for Marion. He was like a light that found its way through the cracks of her pain, blanketing everything in its path with a diaphanous warm comfort. As lovely as that felt, she refused to have her heart mended by one man over the brokenness of another. It needed to be healed by her alone. This wretched wound had taught her not to hand it over so easily and without regard, but her fledgling feelings of affection toward André certainly inspired the crucial change to her year-long condition. It was the impetus she needed to embark on the road to self-discovery she might never have ventured down had it not been for the bruise of wasted love imprinted into her life. In regaining the true sense of herself, she used the insight to build something solid and unwavering with André and a year later he surprised her with a candlelit proposal – their love had flourished splendidly. Now, in dusky retrospect, Marion was sure she'd gained far more than she had lost and she let go of the stale feelings of regret over time spent on the wrong love. Because like the winds that steer the lost boats at sea, she was directed to a better destination. Slipping into her bedclothes, she smiled thinking of this. And, before turning off the lamp, gazed at the sleeping face of the right love.